IF FACEBOOK founder Mark Zuckerberg was called into the principal's office yesterday, today he faced the entire school board. Senators in the US House Committee on Energy and Commerce were feisty, unyielding, and ready to reject scripted, rehearsed answers. 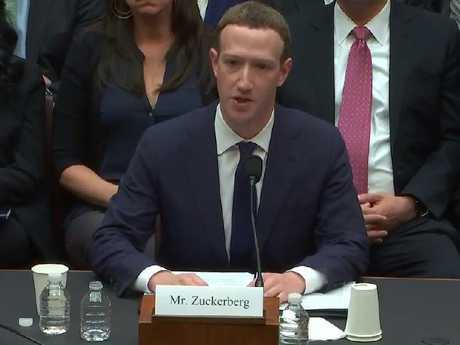 Where Zuckerberg was emotionless, even robotic yesterday, today he was at times rigid with frustration as his answers were interrupted and shut down. At one point, a senator told him she didn't have time to let him "filibuster". And the hot-blooded, better informed, larger group of senators - 55 in total - was able to flush more information from the 33-year-old chief executive even though each was allowed only four minutes to interrogate their subject. - A host of Facebook apps created by Cambridge University might be "bad"
The first truth bomb of the marathon five-hour hearing landed early, as Zuckerberg revealed just how personally the Cambridge Analytica scandal had hit him. Amid a flurry of rapid-fire queries from Democratic Senator Anna Eshoo, who demanded 'yes' or 'no' answers, Zuckerberg answered "yes," his own personal information had been scraped and sold, along with the details of 87 million other Facebook users, and 311,127 Australians. While Zuckerberg's birthdate, location, and perhaps his private messages ended up in the hands of the firm hired by Donald Trump's election campaign team, they might have travelled even further. Questions from Republican Senator Jan Schakowsky revealed Facebook was investigating whether data harvested by Dr Aleksandr Kogan's app had been sold to other companies outside the social network. "I don't believe it was a large number (of companies who bought the information) but as we complete the audits we will know more," Zuckerberg revealed. "What's a large number?" Senator Schakowsky asked. Zuckerberg said he also suspected more apps improperly obtained or sold Facebook users' information, and the company would hire "a number" of third-party auditors to find out. "I do imagine we will find some apps that were either doing something suspicious or misused people's data, and when we find them then we will ban them from the platform and take action to make sure they delete the data, and make sure that everyone involved is aware," he said. The process could take "many months". Some of the apps under investigation - and suspicion - were from Cambridge University, which had "a whole program" to create apps similar to the one from Dr Kogan, Zuckerberg said. "There are a number of other researchers who are building similar apps so we do need to understand whether there is something bad going on at Cambridge University overall that will require a stronger action from us," he said. Overall, while there were moments when Zuckerberg returned to his script in Congress today, or tried to do so, the testy testimony was far more telling. It's clear now this scandal will drag on for months, and you might not know if your personal information has been misused for some time. It's also not yet clear what restrictions the US government will place on Facebook to prevent this happening again, or even if the company and others like it will be regulated. Today's concerns were probably best expressed by Michigan Democratic Senator Debbie Dingell, who mixed healthy cynicism about Mr Zuckerberg's statements about privacy with genuine concern for users. "I worry that when I hear companies value our privacy, it's meant in monetary terms, not in the moral obligation to protect it," she said.